How can you know that changes to your files won’t break anything? Particularly when you start having large numbers of people making and merging changes, and sending you large numbers of pull requests? One way would be to read every single line of text and manually review each change as they come in. However, as projects get bigger, and the number of people working together increases, this becomes an ever bigger and unmanagable task. Instead, a better approach is to find a way of automatically testing every single change committed to the repository. If all of the tests pass, then you have confidence that nothing has been broken (assuming that you have good coverage with your tests). This approach, of automatically running tests on every commit, is called “continuous integration”, or CI. 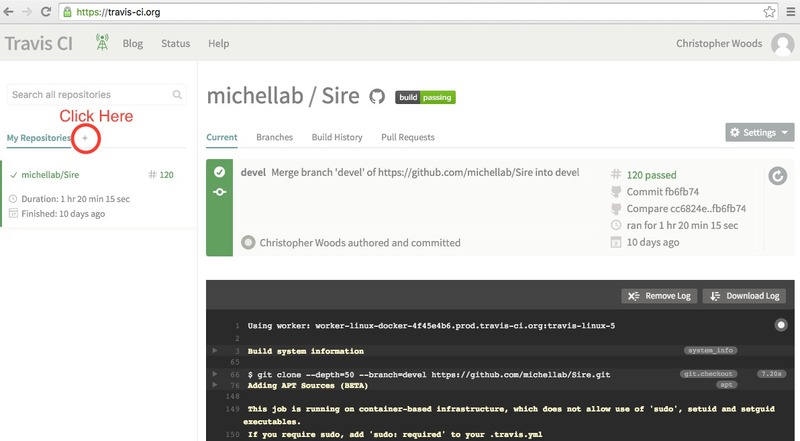 GitHub is brilliant and useful because it has a built in link to a free CI platform called Travis CI. 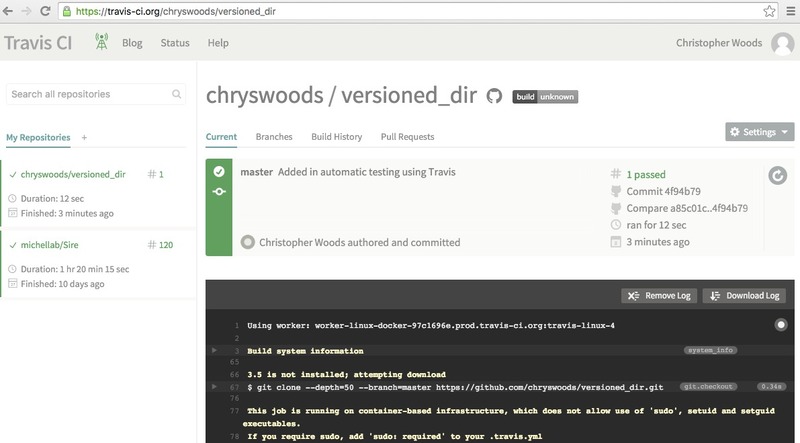 Travis CI provides free servers on which you can sync GitHub repositories and run tests. To use Travis CI, sign up for a Travis account and then next to the “My Repositories” link, click the “+” sign, e.g. Travis CI links to your GitHub account, so knows all about your repositories. 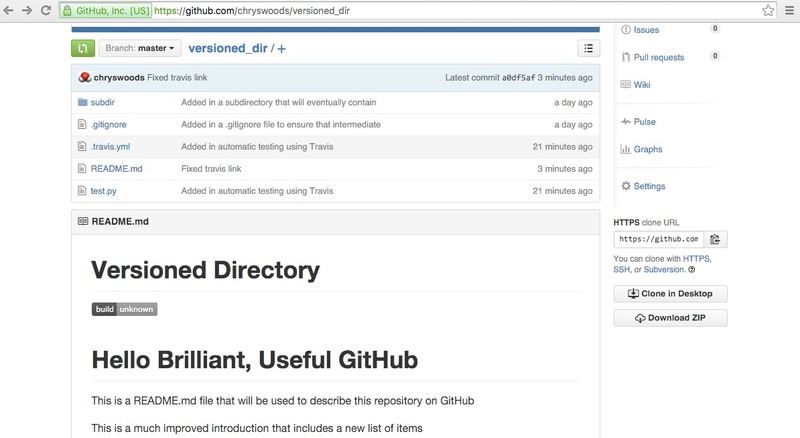 Click the toggle switch to switch on CI testing for your versioned_dir repository. This file tells Travis that you want it to run a test script (which we will soon write) called test.py. This is run using the 3.5 version of the python interpreter (Travis supports a lot of languages and versions. Take a look here for the full documentation). This is a simple python script that just prints out every line of README.MD and then prints Everything is OK. Note that a good test script should actually run some real tests… This is just for demonstration. Add these two new files to Git and then commit and push your changes. Now, take a look at your Travis CI page, at https://travis-ci.org/USERNAME/versioned_dir, where USERNAME is your GitHub/Travis username. For example, my page is shown below. You should see, as above, that Travis has seen the commit, has downloaded and install Python, cloned your repository, and then run the test.py script. You should be able to see all of the output from test.py, including that the test passed, because test.py exited with an exit value of 0 (a non-zero exit value implies failure). The first added lines just create a nice title for your project. Now go to your Github project page, and you should see a Travis icon in your rendered README.MD, e.g. Every time anyone now commits, the changes will be tested using Travis. Sometimes you may only want to commit a small change, and don’t want the test to run. If this is the case, ensure that the line [ci skip] is included in your commit message. Commit your change and push it to Github. Watch what happens on Travis. What does a build fail look like?